SINGAPORE - Share a link with 20 friends and win free first-class Singapore Airlines (SIA) tickets - sounds too good to be true? It is. The scam, which has been circulating on messaging app WhatsApp over the weekend, is the latest involving websites that mimic the airline's branding and look. In an advisory on Sunday (Nov 5), SIA said on its Facebook page and website that it has been receiving public feedback about these phishing sites masquerading as contests organised by the airline. Said SIA: "It has come to our attention that there are messages, e-mails and phone calls that claim to be from SIA, which inform recipients that they have been selected for a draw or have won air tickets, and then proceed to request their personal data. "SIA also wishes to advise customers to be cautious of phishing websites that appear similar to the official website and to exercise caution in sharing their personal details online." SIA told The Straits Times that, since Sunday, members of the public had informed the airline about the scam circulating on WhatsApp. “We explained that the message is not from SIA and that the public should ignore it,” the airline added. Earlier in May, the airline also issued a similar advisory and another one in August, about the prevalence of online scams using websites. In the latest case, the scam appears to play on Singapore Airlines' recent reveal of its new luxury suites on its Airbus A380s, with a picture of the plane on the website. 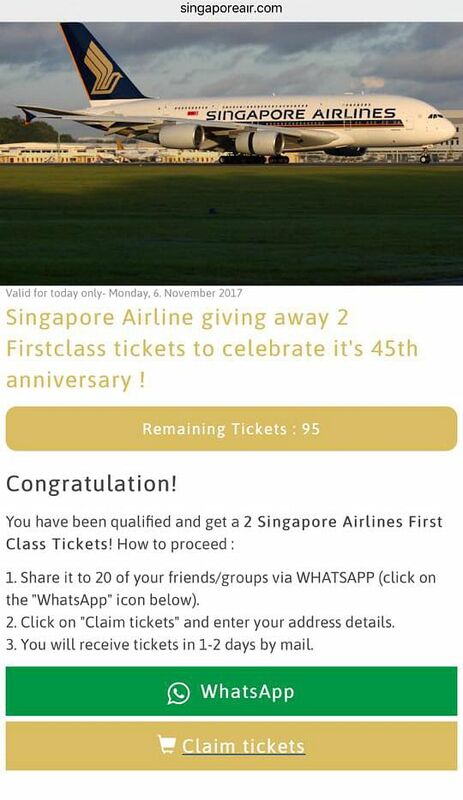 Consumers who open the link will see instructions with grammatical errors and spelling mistakes under the header "Singapore Airline giving away 2 Firstclass tickets to celebrate it's 45th anniversary! (sic)"
Taking part in the fake contest requires contestants to share the link with 20 other friends or groups. The website has since been deactivated and no longer shows the fake promotion. As of Monday, the link has been shared on Facebook more than 50 times. Recipients of such promotions should verify them with SIA and should avoid revealing personal data if they have any doubts, the airline advised, adding that they could lodge a police report as well.